Move Out Cleaning is an overwhelming process; you need sufficient time to do it. You have to check all the things before the move in into another city. It is necessary to clean your current flat before the shift to a new one. It is kind of a headache for those who are renters because they need to take back their deposit money, but this amount will be returned by the owner only when all the rooms will be cleaned & in a perfect condition. Before cleaning your current flat you need to do complete packing of your stuff because if you clean the flat before packing, then again at the time of packing all the rooms will become messy & dirty. Therefore, your first task is to do complete packing of your luggage. After packing lots of waste materials is collected in the wardrobes, it is good to clean it properly & dump all the waste material into the dustbin. After cleaning wardrobes, the next place for cleaning is the top ceiling. Never forget this place ever, it is very noticeable place & your homeowner will never like dirty top ceilings. But one thing keeps in your mind that at the time of top cleaning must take safety precautions. After top cleaning, clean your windows glass & frames with the help of soft cotton clothes. A window should be clean & shiny so that your homeowner did not have any kind of problem regarding the cleanliness of your rooms. Yes, this is the most important place where your homeowner will definitely check before returning your deposit money. So, must scrub the tiles of bathroom & kitchen & clean the sinks. Last, you need to clean the entire room of your current flat because after packing lots of dust & dirty materials collected and you can’t leave it as it is. So, the best way is to sweep all the rooms before leaving your current flat. All the above things are not an easy task for anyone, but you can make it easier by hiring a professional cleaner for move out cleaning. A professional cleaner will always take care of all things, not only that they will also help you in your packing and at the time of move-in cleaning. GSR Cleaning Service is one of them; our cleaners are highly professional & very decent. Now a day’s move-in & move-out is very common. Move-out cleaning can be done by yourself but can’t possible for working people. You are not the only one who is facing this problem in Melbourne, daily more than thousands of people moved into some new place. So it’s good to choose a right cleaner for it. But mostly people don’t know what is included in move in & move out cleaning. Due to this people hesitate to choose any move-out cleaner. Kitchen’s wall, floor, sink, stove top, interior & exterior fridge, oven, microwaves & dishwasher. Overall bathroom cleaning- tube, mirror, tiles & grouts, shower & interior and exterior cabinet. Washing the interior & exterior windows of your home. Ceiling cleaning of each room. Are you facing difficulties in finding a reliable cleaner? Of course, it is not an easy as it looks mostly cleaning company does not give you reliable cleaning. While choosing any move-out cleaner must check the previous reviews by its customers. 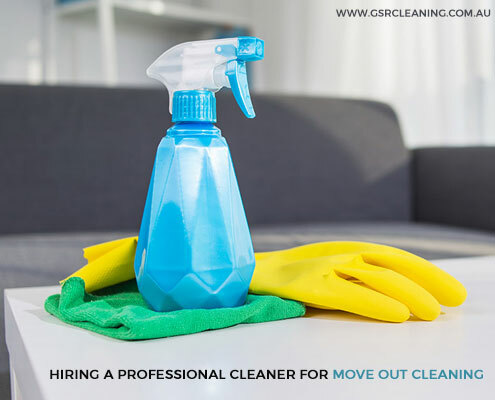 GSR Cleaning Services in Melbourne is the right choice for move-in / move-out cleaning. We never disappoint our customer, we know your requirements & accordingly we provide the services. Choose GSR Cleaning and free yourself from the tension of move-in / move out cleaning.